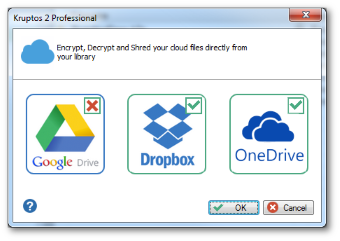 Kruptos 2 Professional includes full ‘Cloud’ integration with Dropbox, Google Drive and Microsoft OneDrive which allows you to secure your shared files directly from your library. Your cloud library folder is a 'virtual view', which means you can’t add or move files from within your library. Your cloud virtual view is automatically updated when anything changes within your cloud provider folders, e.g. if a new file\folder is added to your Dropbox folder then the file\folder will automatically be added to your library.